The term communicative is applied fairly loosely. Typically it’s used to describe any activity in which learners are interacting with one another. So, a coursebook activity in which learners perform a scripted dialogue, or a minimal pairs activity which involves pairs pronouncing words to one another and identifying the appropriate picture on a worksheet, might both be labelled ‘communicative’. No wonder, therefore, that the term communicative approach has become so elastic as to embrace any methodology that foregrounds speaking in pairs or small groups. heterogeneity: participants can use any communicative means at their disposal; in other words, they are not restricted to the use of a pre-specified grammar item. 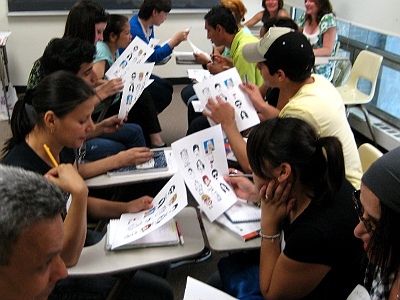 The archetypal communicative activity is the information gap task (of the type that the students are doing in the picture above) where Student A has some information and Student B has some other information, and the task requires that they share this information in order to achieve the designated outcome. Describe and Draw, Spot the Difference and Find Someone Who... are all examples of information gap activities that meet the criteria outlined above. But what is their particular merit over, say, activities – such as rehearsing a scripted dialogue or playing a game like Pelmanism – that are interactive but not strictly communicative? The standard argument (and a key tenet of the communicative approach) is that such activities better reflect the way language is used in the ‘real world’. A corollary to this view (and a core principle of task-based instruction) is that language is best acquired through such life-like language exchanges. Cognitive theorists might add that the attention to meaning required in communicative interaction requires that learners ‘park’ their concern for formal accuracy, and thereby develop strategies – such as ‘chunking’ – that promote fluency. In spite of trendy jargon in textbooks and teacher’s manuals, very little is actually communicated in the L2 classroom. The way it is structured does not seem to stimulate the wish of learners to say something, nor does it tap what they might have to say. … Learners do not find room to speak as themselves, to use language in communicative encounters, to create text, to stimulate responses from fellow learners, or to find solutions to relevant problems (pp 8-9). investment: the speakers have a personal commitment to the communication and are invested in making it work. How you achieve these worthy goals is, of course, another matter! Legutke, M. and H. Thomas. 1991. Process and Experience in the Language Classroom. Harlow: Longman. Excellent points, Scott. At this early stage in what will no doubt turn out to be a very robust discussion, I would like to add that writing is not mentioned here. Is not writing communicative, and does it not both include some of the limitations mentioned above for communicative speaking but also potentially avoid them? – the presence of writing in a course can actually enhance or make up for the limitations often associated with classroom and coursebook-based communicative speaking (often as either a pre or post task to speaking). Just thought it was worth mentioning. Thanks, Jason, for the heads up (as I’m learning to say!). Yes, of course writing shoud be included (and the fact that ‘communicative’ often simply connotes ‘speaking’ is yet another way that the term is rendered fairly meaningless). A perfect instance of communicative writing is what we are doing now – and the potential of the ‘new’ media (blogs, twitter, wikis, etc) to provide opportunities for *invested* written communication is almost unbearably exciting! Nice, Alex. On my Dip (now DELTA) courses I used to have a handout which was essentially a collage of different activities from coursebooks, most if not all involving interaction. The task of the trainees was to decide which tasks – as well as being interactive – were communicative. Of course, factors like negotiation and heterogeneity are functions of the actual task performance, and difficult to predict in advance, but whether or not the task requires reciprocity (i.e. that there is as much a need to listen as to speak) is a key indicator, I’d say. ‘Telling your neighbour about your weekend’ does not require reciprocity. ‘Talking to your neighbour about your weekend and finding three things that you did in common’ DOES. Of the two examples you just gave, although the latter may be more ‘communicative’, I would argue that the former is definitely more authentic and perhaps, a more useful activity as a result. After all, isn’t the former just another information gap activity like the ones you mentioned above? I can’t ever remember a time when I’ve tried to find three things in common with someone about my weekend, but there have been plenty of times when I’ve told someone or they’ve told me about their weekend. And of course, in the ‘real world’, the former WOULD require reciprocity as it would sound pretty rude if the listener didn’t even comment on the speaker’s weekend in some way. But I suppose in a classroom, if you’re only telling your partner about your weekend (and your partner is only listening) because your teacher told you to, then I suppose those social norms don’t really exist and reciprocity isn’t necessarily required. However, if the same conversation were initiated by the students instead of the teacher, then I would argue that this were an example of ‘big-C communication’. On a slight side-note though, I’m currently doing the Trinity Diploma and I was talking with my tutor the other day about the need to teach both halves of the conversation. I think most course materials and teachers (I include myself in this) generally only teach one half of the conversation and neglect to think about how the listener should respond. This is perhaps one of the reasons why course material and teachers favour slightly unnatural information gap activities over more conversational type speaking activities. The conversational activities are much more likely to fall flat if the listener doesn’t have the linguistic means to carry on the conversation, whereas an information gap activity demands that both sides keep communicating, no matter if the ‘communication’ is authentic or not. In my assessed lesson tomorrow, I shall endeavour to teach both halves of a conversation and hopefully I (and the students) will notice the difference! Thanks Peter – an insightful comment (which augurs well for your success on the Diploma!). It’s interesting – your point that there is a tension between authenticity, on the one hand, and communicativeness, on the other – and perhaps that’s why the history of CLT is littered with fairly daft – but nevertheless highly productive – activity-types like the info gap. Not authentic, but communicative. As I argued in another post (A is for Authenticity) perhaps in the truly authentic classroom there would be no need for such contrivances. As for your comment about ‘the other half’ of the conversation, I remember a talk by Mike McCarthy in which he convincingly showed that the interpersonal component of communication is largely located in the ‘third move’ of the classic IRF exchange. I.e. S1. (Initiating) You do anything this weekend? S2. (Responding). Not a lot. Marked 30 assignments. S1. (Follow-up) Wow, I’d say that WAS a lot! The toughest of all the toughies? Glennie said: “‘…the speakers have a personal commitment to the communication…’ The toughest of all the toughies?”. At first I would say that it certainly feels like the toughest. For one, just the word commitment has so many nuances, so many interpretations, so much subjectivity in itself. And I certainly don’t have the answer to that. More like more questions. Isn’t the simple (??) fact the student attends the classes and does the work he’s told a sign of personal commitment? Of course we have to exclude those who are forced to be in class by their parents – I am speaking from my experience of being an EFL teacher in Brazil. But in general, all students have a personal commitment to the communication, because that’s their goal in learning English. Isn’t it? As for writing being communicative, I completely agree with you Jason – and Scott. And add that for some people writing may be the most effective way of communication, especially in a second language, for it gives you the possibility of actually “reviewing” what you are about to communicate. It gives you the opportunity to rephrase something you feel doesn’t say exactly what you mean. It gives you time to think of the best word for something. But hasn’t writing been somewhat overlooked through the whole “communication-is-our-goal” craze? Great post, great discussion, great comments as usual Scott. Thanks, Cecilia: your point about writing being (for some learners) “the most effective way of communication” is SO suggestive that I think there’s a whole paper/blog post/article/conference plenary talk/etc/ to be written about it! This observation signals a major methodological shift in emphasis – from the largely ‘speaking-dominated’ methodologies that have prevailed since the end of the 19th century to – at the very least – more multi-modal methodologies that are better attuned to existing (and immanent) technologies. Will have to sleep on this! I think that’s interesting… I’ve started thinking more and more about multi-modal communication since seeing this lecture http://www.soas.ac.uk/events/event53702.html from Gunther Kress (the video is at the bottom of the page – it’s quite long, but worth watching) and wondering how it relates to life today. I think that modern communications technology probably has lead to a renaissance of sorts in terms of written communication. I think it was David Crystal who in the midst of the hysteria about txt spllng msing up teenagrs riting, pointed out that actually, people are adept at code-switching and in fact it was giving writing a prominence that it had not had for a long time. I think the same is true for us as teachers… the comments here have made me think about the activities I’ve used with forums and websites (which I blogged about here: http://classroom201x.wordpress.com/2010/01/04/moodle-forums-for-esol-students/). The first set of activities, for beginner level classes might just scrape through those criteria as communicative – though I reckon they’re still a bit on the prescriptive side – and low-level IT skills tend to restrict the communicative nature of the activity (where I work, IT confidence seems to broadly correlate with levels of English… I can guess why, but I think I should look into that a bit further… anyway, I digress). However, I think that the activities for learners with higher levels of English really are communicative. I still find myself asking how I can justify not just running these activities as speaking exercises (especially the lower-level ones), but maybe I’m falling into the ‘communicative – has to be speaking’ trap. For many school and even university students, the goal is to pass their English course by doing whatever the teacher requires of them. The commitment is to passing. So, depending on what students have to do to pass, communication may or may not be of great significance to students. An improvement in a student’s ability to communicate is a difficult thing to measure and quantify with confidence, so some teachers understandably do not make it central to their numerically expressed assessments at the end of the term. They may, of course, believe wholeheartedly in the primacy of communication and give their students ample opportunity to communicate in class. However, if students detect that, say, written grammatical accuracy is going to be the determining factor in their mark at the end of term, that may affect their attitude to communicative work. Of course, if communicative activities frequently prove to be fun or absorbing, then that will help. Whatever your assessment criteria, if, when you break into a communicative activity because class is over, your students respond with ‘Is that the time already?’, you will know you have got it right. This has been my experience in my current teaching context. Many classes need some kind of postive washback (if I remember the term correctly) in linking exam criteria and relevant chunks/phrases to speaking activities. Even if they then deviate and the discussion becomes more student driven and authentic, setting up the speaking activity is often met with more willingness to fully participate when the exam criteria and speaking functions are clearly up on the board for all to see! This feels a bit like a tutorial to another DELTA tutor but it’s always an interesting discussion to engage in. I quite like Keith Johnson’s principles for a communicative exercise (ref below) which I regularly use with trainees up and down the spectrum. Some mirror points you have made, Scott, especially “contingency’. Typically, these would be matched up with a number of teaching implications and/or activity types. According to Johnson, these need not apply all at the same time (although he does not make it clear which ones or how many must apply for an ‘exercise’ to be considered communicative). For reasons that probably have to do with some sense of not being fully satisfied by just these, I have always added my own makeshift two (not truly my own, as they derive from other definitions) but their wording is, at least. I think this last one is the hardest to create, even though students do know what they are in a class for – genuine desire to communicate is not easy to generate and I suspect information gap activities are not the kind which will motivate learners and stimulate the wish to communicate. Marisa, thank you for enriching the conversation by cross-referencing the Johnson criteria. These are great – how come I didn’t know them? I like your additions too – although perhaps you could clarify “the ego principle”? I guess I know about them because Keith was on my MAAL course at Reading (my supervisor for my 1st dissertation). By “ego principle”, I really, very simply, mean what we commonly call “personalisation”, some link or relevance of the context to the learners’ world, or even, more directly, some opportunity to talk or share information about self and own lives. Not terribly original, in case you thought it was, but I have often thought that with certain types of learners, this tends to maximise “investment’. Scott, thanks for one more great post with lots of food for thought! Unpredictability – this is a wise word that should be on any list that attempts to describe the triangulation between language, teaching and learning. It can’t be everywhere though , otherwise researchers would be in trouble, but anyway, I really liked it and haven’t seen it as a bullet point of mainstream methods/approaches. The first thing that came to mind when I read your first description was that I missed something like authenticity, which is often in my explanation of communicative XYZ when training teachers; and since Peter Fenton also said “I would argue that the former is definitely more authentic and perhaps, a more useful activity as a result”, I started a brief research on it and started to question the idea of the more authentic the better. Although it has already been greatly discussed on A is for Authenticity, here’s one interesting piece I found that I thought was worth sharing. Thanks Willy for that – coincidentally, your comment came in just as I was responding to Peter’s point about authenticity, and the trade-off between that and communication. Yes, and thank you for mentioning play: some of my favourite communicative activities are in fact games, of the type 20 questions, or What’s my line? Because the game-element imposes a ready-made ‘need to communicate’, while at the same time the games are often those played outside classrooms, they achieve a degree of authenticity that the more contrived communicative activities (like Describe and Draw) do not. But I just wanted to comment that I especially appreciate Scott’s contingency and investment items above. I’ve started to feel uncomfortable with the term ‘authenticity’ myself, because it suggests too much an either-or approach to classroom activities. Perhaps what’s better might be a concept of internal or self-contained authenticity to tasks, derived more from that particular task-context rather than from some absolute sense of ‘real-worldness’. As Scott and others point out, games are not absolutely authentic; rather, they are often stylized or reduced simulations of aspects of real life, but no less engaging for that. So perhaps instead of ‘authenticity’, we could refer to a kind of contextual validity to tasks, which is what surely what leads to both contingency and investment. It’s been fun reading the post and the comments which have followed. I’ve been worried about the ‘communicative approach’ for years – because everyone says they do ‘it’, but there is no agreement about what ‘it’ is. Functional language? Communicative activities? Lots of talking? meaning-focused? I was fairly happy with a very old list of what makes communicative activities which I still use: a desire to Communicate, a purpose for communicating, an emphasis on content, not form (which rules out quite a lot of info gap activities), a mix of language (not one language item at a time), no teacher intervention during the communication and no materials-mediated language control. Hmm. But a new and real interest for me is what, if anything, such activities might actually do for students. I am beginning to think that Ellis WAS right way back in 1982 when he suggested they might be a ‘switch’ which chucked things from short to long-term memory. Or rather, since that doesn’t quite do it, it is the process of trying to encapsulate thoughts into words which has neural network consequences, synapsual connections growing. It’s the PROCESS of classroom communicating which has good effects on the brain, rather than the PRACTICE of communicating itself. It’s all about the brain!! So Jason and Cecilia are absolutely right to focus back in on writing; the MENTAL process of putting things into words (with all the monitoring, re-viewing etc) may actually be more communicative than the full-on ‘in the moment’ spoken communication that so many teachers use in the vague hope that it will do ‘something’ – provoking fluency etc. Sorry. Thinking aloud. It’s just that more and more it seems to me that what happens in the brain as students try to use words that really matters, however authentic or inauthentic the interaction/situation etc is. Thanks, Jeremy: no discussion of the meaning of ‘communicative’ would be complete without your input! In fact, “Harmer’s six points” (as they were referred to on many, many Diploma courses that I taught in the 90s) stand up fairly well over time, and, if anything, my post was an attempt to map on to these the kinds of factors that might indeed trigger ‘deeper level’ processing – the kind of thing that Stevick referred to as ‘depth’ (both cognitive and affective). Being ‘invested’ in a task that is contingent with (or connected to) the learner’s here-and-now might support this kind of processing. Might. And I’m intrigued by the reference to Ellis 1982 – details? My reading of the ‘switch’ has broadened since then. I don’t think that switching is (or needs to be) an automatic process; on the contrary as Jason points out – and as he shows, you also think this – getting the brain involved either consciously (through e.g. writing) or less consciously (from e.g. jolly communicative activities) is what really matters. That processing really is language learning and as such, in most classroom settings is (hey I can’t believe I’m about to say this) superior to any acquisition model…. Thanks for the Ellis citation, Jeremy. The ‘switch that starts the flow’ is a compelling metaphor. There is certainly a lot of anecdotal evidence that alludes to these ‘breakthrough’ moments when ‘one’s tongue is suddenly unleashed’. I clearly remember a Catalan class, where, after several rounds of Alibis (itself a quintessential communicative activity) my head was buzzing with Catalan for hours. More often as not, though, the ‘switch that starts the flow’ is a glass of the house red! Just a quick one to add to all this great discussion: If I hear the words “all this thinking is making me tired” then I get a sense I have succeeded as a facilitator of opportunities for brainwork during language production activities. It’s two fold, a cognitive process is going to help habituate the use of new target language, and also, the gameness 😉 of an activity is going to motivate the participant stretch herself to express what is needed during the task. Not that quick an addition I know but this is a good topic. And see my mention above to my experience of playing Alibis in the Catalan class. We were so involved in trying to hoodwink our “interrogators”, while at the same time, so immersed in trying to co-opt the past tense for our purposes, that I came out with “my head swimming”, as they say. How many language students can honestly say that this is a regular sensation? That, at least, is one of the strengths of the communicative approach – that it aims to maximise opportunities for just such a concentrated and productive engagement with the target language. I’m really glad to see that the mention of writing has found some resonance here in a thread about “communicative.” I agree totally with Jeremy’s point about a primary issue being what is happening in the brain, and connections between short and long-term memory. I would, in fact, be brazen enough to claim that any course (or coursebook) that claims to be promoting communicative speaking ability, but doesn’t feature writing, is only getting half the story and will be less effective overall than one which integrates writing. I stumbled first on this as a relatively inexperienced teacher, drawing on my own experience as a second language learner. I struggled for a very long time to manage even very crude spoken communication in Swedish. Then I started keeping a diary in Swedish, doing a couple of entries every day. It was refreshing to have the time I needed to flesh out thoughts and feelings more expressively, and to grapple with my grammar and vocabulary limitations in a “private setting.” Within three months of starting that diary, my ability to communicate in live conversational settings improved drastically. Part of it was due to the fact that I had already learned to express a variety of things in written Swedish, the writing process had slowed things down enough for me to understand and really absorb things more, more high-frequency practical *chunks* were starting to form, and there was basically more self-confidence – a feeling of competence that coincided with a greater willingness to take risks. So in addition to always encouraging learners to keep private diaries in English (or an interactive one where they are able to communicate and interact with their teacher), I’ve always tended to work writing into a communicative teaching framework. If students do some sort of interactive task, it’s a good idea to have them summarize or try to reproduce (or approximate, or expand) it in writing. A program that requires students to exchange emails and letters on a regular basis is likely to see better progress is spoken conversational ability as well (assuming of course that the teacher finds the right ways to incorporate both formats into the classroom approach). Once the technology became available, I saw enormous benefits from having the learners sit down and do chat-based discussions in written chat programs, before, between or following up from face to face conversational tasks. Beyond the ‘processing’ benefits for students, as a teacher I found this was brilliant for me as well in terms of observing and dealing with communication strategies and emergent language (different but related issue: one reason I think a lot of teachers would struggle with an approach like Dogme is that they too struggle with the processing time required to deal with communication patterns, strategies and emergent language – so writing helps slow things down to a manageable level for teachers as well!). Of course, if there is too much emphasis on *just* written communication, it can potentially put a bit of a cork in a learner’s communicative juice bottle. But without writing to supplement, slow down and drive communicative ability, I think it can be a bit like limiting how much accessible juice ever ends up going into the bottle to start with. Sorry to take up so much space, Scott! Stop writing such interesting and thought-provoking blog posts, would you? Some people have work to do! I’ve been feeling a litte confused about the contributions being made here re. the potential usefulness of writing. Given the title of this blog, perhaps we need to be differentiating between genuinely communicative writing activities, e.g. writing blogs and responding to them, and non-communicative writing, e.g. rewriting or dictation. However, having said that, I realise that both types may in fact make their contribution to communicative competence at the spoken level. Communicative writing tends to involve what might be termed ‘deep processing’ of language as the ‘investing’ writer struggles to give clear expression to thoughts. Language choice *matters* to the student and the intensity of the process can only favour the acquisition of language which, given the appropriate context, will resurface in speech. Non-communicative writing can be controlled by the teacher so that it focuses on language chunks whose subsequent use in speech will lessen the processing burden on the student. Thanks, Jason, for this riff on the value of writing as a bridgehead into (spoken) fluency. Sounds like there is the makings of an interesting research study here: the group that had more communicative writing tasks compared to the group that only did speaking: pre- and post-test for accuracy, complexity and fluency effects. Anyone know if this has been done? I am tempted to look into this myself with my own TOEFL online students. I have several hundred submissions across multiple tests, with a range of students taking speaking and writing together, others only taking the speaking course. There could be some threats to initial validity (not to mention the problem of an online course and not knowing exactly how students are preparing in their own time), but the sample size could be potentially large, as could the range of data (with 6 full speaking tests and 5 full writing tests taken over a period of 1-3 months). There are also some interesting correlations between certain speaking and writing tasks (Speaking question 2 relates well to writing task 2, and speaking question 4 relates well to writing task 1), and a very clear holistic grading rubric (reflecting the ETS obsession with reliability over validity). Bring in some other graders to ensure inter-rater reliability… Add to that some other measurements to triangulate the data (for example – off the top of my head – measurements based on T-units and/or lexical depth, etc.) and it could get very interesting. Scott, I think you have just given me a riveting idea for my MA Thesis! Man – where to begin – my little heart’s a flutter. Having spent a year researching and writing my MA TEFL dissertation (available under iDiss tab on my site below) on the topic of Extensive Writing (EWr) as a fluency-based approach in a Japanese EFL high school context, I absolutely love what Jason, Jeremy, and Scott have said about the “communicative” potential/necessity of writing. After 14 years of struggling to get beginners to speak (output) in front of their peers (scary), and in front of a foreigner (scarier), in 2007, I was asked to teach a writing class to 2nd and 3rd year high school students. Knowing that I could never teach it like my Japanese peers, as a grammar-translation (GT) exercise, I decided to give the students what I instinctively thought they needed at the relative beginnings of their English career: lots and lots of practice writing. What began as “10-minute writing” has evolved into having them actually writing anywhere from 50% – 80% of the class time. The remaining time is made up of topic introduction, some one-point meta-cognitive lessons, or students themselves discussing/brainstorming content ideas. I could go on for hours, but the main point that I’d like to toss out for some reaction is that after 21 years teaching in EFL Japan, I feel that for beginners (most of the country) an opposite approach to what’s been the main paradigm in EFL – have foreigners teach speaking and listening (output/input) – works better for me. What I mean is that by focusing on reading and writing (input/output) primarily from beginner to low-intermediate, while facilitating and augmenting with listening and speaking in a Nationesque balanced approach, gets much more “bang for the buck”. The Japanese have said, “Leave the grammar, reading and writing to us” but have not actually taught any useful reading or writing to date. It has all just been the same old grammar-translation (for testing purposes). Anecdotally, I just had coffee with three recent high school graduates last week and when one girl said that she thought our writing class was the most meaningful English study she has done to date and that everyone in her university class marvels at her writing ability, the other two girls squealed, “Me, too.” Of course I was pleased, but also thought, “It’s so bloody obvious that communicative writing practice leads to linguistic improvement, builds self-confidence, and creates further motivation, I wish all Japanese high school students had the same opportunity” as these girls did. That is so interesting, Steven! Now, I need to go and track down that dissertation of yours… Cannot wait to get my hands on it, actually! Thanks, Steven, for your impassioned comment! (And it’s interesting how this thread has morphed from a discussion of ‘communicative-ness’ to one on the role of writing in SLA). See also my response to Jason, above, and the need for more research studies to validate the formative role of writing in spoken fluency. It’s interesting to read about your experience. I had a similar experience teaching a creative writing module to a group of Asian students, mainly Japanese, with some Korean, Taiwanese and Thai students as well, at a UK based school about 15 years ago. It was an optional course. Students could choose between drama and writing. So obviously, I got the students who were quieter, less confident at speaking, the ones who didn’t want to get up and act in front of their peers. The levels ranged from weak pre-int to advanced (labels applied by the institution based on “communicative ability”). We spent two hours a week together. The students worked both individually and collaboratively on short texts, mainly prose, some free verse towards the end. The response was amazing. In a questionaire at the end of the course (it was the first time the option had been offered) so many students commented that they now felt more confident when speaking English, and this was backed up by their classroom teachers. And, not surprisingly, it was the lower level students who benefitted most. The ones who had more processing time, the ones who learnt from their peers, the ones who needed the “comfort zone” of writing to come out of their shells. Ever since I’ve tried to bring that kind of writing experience into the language classroom whenever I can – whoever I’m teaching – and to introduce trainees to the idea of writing to learn and writing to communicate. It’s think it’s such an important tool in the classroom. “To develop communicative competence, or oracy, learners in CLIL need communicative functions….etc” (page 16). This elision (communicative = speaking) is beginning to look shaky in this discussion (cf Jason, Cecilia, Glennie, Steven, Ceri). That’s all I wanted to say. Couldn’t resist! To equate communicative with “oracy” is only half of the overall equation, and as you have (in my opinion) quite rightly alluded to earlier, could be missing out on genuine opportunities for deeper processing (and yes, I love the fact that we are not only looking at the notion of “communicative” but how the ability develops, what facilitates it for second language learners in particular, etc. Sort of not just the “what” of communicative but also the “how”). I hope I’m not too far off topic. I work as an EFL instructor in a small ekaiwa (English conversation) school in Japan. I’ve always used art or drawing for my young learners, and recently I’ve incorporated drawing in my adult learner classes. I’ve switched to using picture dictionaries for the class textbook and supplementing the picture dictionary with my own handout sheets. As I have been making my own materials, I have been doing more and more drawing tasks. As for phrasal verbs, student generated drawings seem to have worked very well. The students seem to understand the idioms better and by sharing their drawings, the other students have understood more as well. What do you think about using student generated drawing in a conversation class? Thanks for your comment, Mark. I love the idea of using drawing to support language learning – I wonder if anyone has used this idea with older learners? You were the consultant and editor to a fantastic book by Jenni Guse – I’d love to get in touch with her to ask her to be a speaker at a symposium down the line — could you possibly help out?